The Yas Marina racing driver experience was not just about the pain of physical and mental tests though, it was also about exploring life behind the wheel of racing cars. Getting blown away by racing drivers in karts (this time it was Formula Renault front-runner Aaro Vainio's turn to show how it is done) was nothing new, but getting some feedback on driving from some seasoned pros was invaluable. Grand prix winner Jean Alesi had the pleasure of experiencing my first laps in a pukka race car – an Aston Martin GT4. Although the 4.7-litre V8 engine makes the car a pretty good handful, it felt hugely responsive and forgiving – and Alesi reckons that it's a pretty good machine for getting some early experiences of race car driving. "For someone who is on the race track for the first time, this car is good because it is compact - the car is not too big," explained Alesi. "The balance in terms of power and weight is good, and at the end to be on the maximum of the potential you have a lot to do. "You need to sacrifice a little bit the speed in the slow corners, and the hairpin, to get early on the power – that is the key. As soon as you try to carry too much speed into the corner, you lose the line and then you have a slow speed exit." Despite some tweaking of my racing lines, especially through the kink into the first corner of Yas Marina's south circuit, Alesi saw some strengths and weaknesses from my performance – and marked me with a seven out of ten. "You progressed a lot in terms of anticipating the braking to go more at the apex, which is good because in a way it helped you to have a better exit speed. "But when we caught the car in front, we were a lot faster and then for one lap we stayed at the same distance because instead of keeping your concentration of what you were doing, you were too much focused on the car and making the same mistakes as him and you then stuck at the same speed as him. "You also need better transition between off the brakes and on the throttle. It is very important to link braking and throttle, and that is what you need to focus on. There are some places where you were okay, but there were places where there is too much time between the two." Next up was a Yas Marina Supersport SST – better known throughout the racing world as a Radical. Although having the same steering wheel paddle-shift system as the Aston Martin, the whole experience was much more like a proper racing car. My tutor this time was former FIA GT champion Jamie-Campbell Walter, who reckons the car is the perfect next step from the Aston Martin in terms of learning some high-speed driving skills. "The Radical is always known as a mini sportscar, and it is very forgiving so it doesn't try and spit you off the road," he said. "Whether you are a good driver, a bad driver or in the middle, it is a good fun car. And that means for someone like you, a good amateur driver who knows the basics, pretty quickly you're able to get up to speed. "On the other side of the fence, I had some pretty bad drivers but it didn't try to spit them off the road. They were braking too deep into corners, on the power as soon as they turned in and things like that, but it didn't do anything nasty – that is the beauty of it. It is a great car that you can learn in, make the odd mistake and go across the line – but doesn't chuck you in the barriers." Although the car itself felt comfortable being pushed, Campbell-Walter said even it had exposed one of the key weaknesses that is non-existent in us non-racing driver types. "Something a driver does, and I noticed it less with you but a lot with the others, is looking through corners and not at them," he said, having corrected me no end of times about my line into the double-apex right-hander before the Yas Hotel on track. "It is something you cannot teach enough. Your lines come from using your eyes. As a driver your eye-to-hand co-ordination is super, super important and it is something that drivers train a lot on. "You are looking at what is about to come, but that has already been processed in the computer up here [brain] of drivers. We are looking at the braking point of the next corner even though we are only at the first apex. So we are way ahead of you and, as the speeds go up - F3 to F1, the processor in the brain has to work faster. "Half of it is the technique of using the tools your body has. We don't have another set of eyes, but we are processing the information that is coming up. That is the biggest thing that guys like you have to learn - to be one step ahead, sometimes three. 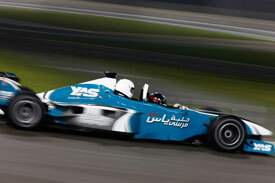 The final step up on offer was to drive the Yas Marina Circuit's own single-seaters – the Formula Yas 3000 cars. These single-seaters are fitted with Cosworth-developed 3-litre V6 engines and deliver performance that comes close to an F3 car. Although being single-seaters meant there was no luxury of having a racing driver sitting alongside us to guide us around, F1 driver Bruno Senna was given the honour of being our pace-man – lapping in front of us to make sure we didn't try to go beyond our talent. Even not driving at the total limit, you could still feel the forces through the corners – and the aches in the muscles that had earlier been put through their paces in the physical tests. Senna reckoned this was probably as close as a non-skilled driver could get to a performance car, but made it clear that once the car gets close to the limit its whole characteristics change anyway. "It is a proper single-seater, it is just that you only feel it properly when you are driving it harder," said the HRT driver. "The car has good brakes, it has good tyres and you get an idea of how to brake and turn a single-seater. With the power it has, when you are trying to get to the limit you need the car control. "Everything is much more aggressive. When we were driving around, everyone was gently on the brakes and turning very gently, squeezing the power very gently, but everything becomes much more compressed into corners when you are going fast. The G-forces will start giving you neck pains and you start getting body pains that are inherent to these cars. "This car can be close to an F3 car, maybe less G-force but probably a bit more power on the straight. F3 is quite fast already." Despite having lived for 48 hours at the Yas Marina like a racing driver – including the high of a room at the circuit Yas Hotel where the F1 stars stay on race weekend and the low of that neck exercise – there is still a gulf between what a normal person like myself can do and what the top-line stars are capable of. For while a ramp up of the physical training regime and a bit more practice on concentration games could lift my test scores – being able to take a fast and nimble F1 car anywhere near its potential would still be a huge ask. It is one thing aiming to get good scores on all the Formula Medicine tests, but it is important to understand that they are not simply a means to themselves but a tool for sportsmen to improve themselves. 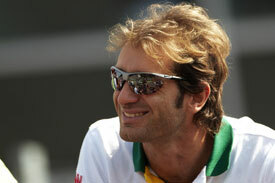 Speaking to Jarno Trulli in Japan last weekend, his eyes lit up when I mentioned all that we had been through – especially the Formula Medicine elements. "It is very useful, especially for young drivers, because very often you find young drivers are very talented with a lot of skills, but sometimes your concentration is not so good and you miss mental training," he said. "You use a lot of these tests in order to grow up and shape up mentally, and to find your way of working and training. Straight away I believe from that kind of exercise that you can probably analyse a person and a driver to understand what you are facing. "I am not saying that you can understand if he is good or bad in driving, but you can understand if he is lacking in some area or is particularly good in one area - because when you drive a car it is not just driving and sitting at the wheel. There is a lot of mental training and exercise going on which takes a lot of effort from yourself in general. "Actually the less you think, the more natural you are - then the better you can concentrate on the driving and getting all the feeling through your body and reacting. "I have been working with Formula Medicine for years and I have been always passionate about general sport and fitness. I have seen some very good drivers being very bad in this application of this system, which is what then happened on track. "They were probably good and could be good on one lap but were very inconsistent the next lap. That is probably due to the fact that they were probably not ready mentally in keeping themselves at their peak, or were mentally not strong enough – so this helps you as a driver, as a manager. It gives you a picture of what he needs to improve himself." Sitting behind Alesi at the end of the two days in Yas Marina's F1 two-seater - getting thrown around in corners and pulled in every direction during braking and accelerating - and then thinking back to all the physical and mental preparation that goes on before you consider turning on an engine, you really come to appreciate just how many elements it takes to become a top F1 driver. Senna himself reckons that more track time would help matters, but is sure that the F1 two-seater experience offers the best glimpse of how men like him earn their living. "If you had another day driving the car, then you would start to absorb it more," he said. "You would feel more confident and know what you can do better. You would really start appreciating it and doing better, but these two days were a good start. "But the experience with the two-seater, that is as close as you can ever get to F1. If you drove the car yourself then you would not get the most out of it – but being driven by someone on the limits shows you just what is possible." After 48 hours at Yas Marina, I don't think I'll ever be able to look at a racing driver in the same light again. I salute you all – even with my sore neck, arms and shoulders!